It's a long-time Holy Trinity Church tradition at new Holy Trinity Church location! For over 40 years, Pittsburghers travelled to the North Side for for great Greek food at the Holy Trinity Festival. We are now in our fourth year at new neighborhood in the North Hills at the corner of Babcock Boulevard and Cumberland Road, across from UPMC Passavant Hospital, and have we got a Festival for you! Join us in our new home for the biggest-ever "Taste of Greece." Great food, dancing, company and Greek tradition. 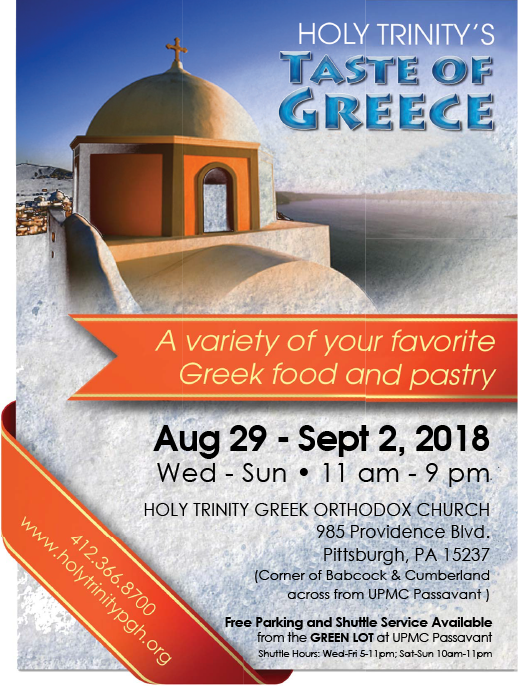 Post the pdf Holy Trinity Taste of Greece 2018 Flyer (1.27 MB) so you remember the dates! We look forward to seeing you there! NOTE: To make your purchases easier, we accept VISA, Mastercard and Discover in addition to cash and checks. Our address is 985 Providence Boulevard in McCandless Township, PA. BUT - we might not be on your GPS if it's an older model or hasn't been updated! The best bet is to look for either UPMC Passavant or LaRoche College, 9000 Babcock Boulevard, Pittsburgh (we’re across the street from both) - on the corner of Babcock Boulevard and Cumberland Road. We have limited on-site parking, but we’re also running continuous shuttles shuttle buses from the UPMC Passavant Green Lot (Wed-Fri 5pm-11pm; Sat-Sun 10am-11pm). 3. Is there a charge to enter the festival? Never! It’s always free to look around and enjoy the music, dancing, and vendors. 4. What will you be serving? Traditional Pork Yeero – Hand stacked pork shoulder meat, slow roasted to perfection, wrapped in grilled pita bread. Topped with tomatoes, onions, lettuce, and tzatziki sauce. Prepared and served the way it’s done in Greece! We accept cash, checks, Discover, Visa, and MasterCard. 6. Is the facility accessible? All areas of the facility are accessible. There are a limited number of accessible parking spaces on-site, but we would suggest using the shuttle buses from the UPMC Passavant Green Lot (Wed-Fri 5pm-11pm; Sat-Sun 10am-11pm). All shuttles are designed for handicap use and will drop off at the entrance to the church - closer than most of the parking spaces on-site! 7. Is there an entertainment schedule? There will be a Greek band playing nightly, from 6pm - close. The HOPE, JOY, and GOYA student ministries will be dancing – days and times TBD. 8. Do you offer carryout? You are welcome to ask any server to pack up your order for takeout, and we will do our best to make sure that it stays warm until you get home! 9. Can I phone in my order? We are not accepting pre-orders this year, but we are looking forward to offering this option in festivals to come! 10. Will I be able to tour the new church? Yes, we will be happy to give you a tour of our beautiful new church. Tours will be taking place every hour on the hour from noon to 8:00pm.